Gazpacho Manchego only shares its name with the cold soup from Andalucia, that is mainly consumed during the summer, apart from that they have nothing in common except for the use of bread, which is pretty common in Spanish cooking! 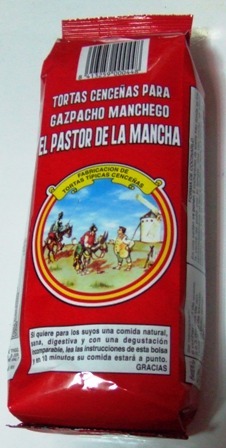 Gazpacho Manchego originates in La Mancha, and it is actually mentioned in the book “Don Quijote de la Mancha” with one of its other names "Galiano". It was the shepherds of La Mancha that created this dish, and in fact Galiano means "glen". This happens to be one of my wife’s favourites dishes, as it reminds her of her roots. Even though it carries the name Manchego, it is eaten in many areas, especially the Spanish regions of Madrid, Alicante and Valencia. There are also similar dishes, which are eaten in other countries, including Gaspacho Oranais which is eaten in the North-West of Algeria. This is mainly a game meat stew eaten with unleavened bread which happens to be its most peculiar ingredient. Originally the plate for gazpacho manchego was the unleavened bread itself, which is where the popular saying comes from “de los gazpachos se come hasta la cuchara y el plato". In the past Gazpacho manchego was left on the bread until the bread was soaked and the consistency resembled a tortilla. There's a variation, which is called gazpacho pastor, from Cuenca, which is not allowed to soak, so it's more like a broth. However today the bread is more commonly incorporated directly into the stew during the cooking process. Also back in the old days, people would often bake their own unleavened bread to use in this soup, and there can be no doubt that this is the best way to make this dish. However, that can be a lot of work and many Spanish supermarkets sell ready-made versions of the bread. It is not exactly the lightest of dishes, so avoid any starters before tackling this wholesome winter meal. Nevertheless if you are a true food lover, Gazpacho Manchego is a must. I still remember my first plate to this very day and they left an everlasting impression. Cut the partidge, the rabbit and the chicken into pieces or ask your butcher to do it for you. Add all the meat to a pan with a large dash of extra virgin olive oil and start to fry the meat until it is nicely browned. Now add the tomato, the peppers, the onion, the whole garlic (unpeeled), the bay leaves, a sprig of thyme and about 20 peppercorns and fry for a further 5 minutes. Meanwhile, heat up the water and when you have finished frying add the water to the pan until it nicely covers all the meat. If you have any left keep it on hold for later just in case. Let it boil for about 30 minutes. After 15 minutes of boiling add the mushrooms and the saffron and test for salt. If the stock runs too low (below the level of the meat) and it starts to dry up just add some more hot water. When it has finished boiling, remove from the heat. Take the meat out of the pan along with the garlic and let them cool down, so that you don’t burn your fingers. Now take the meat off the bones (best to use fingers) and also peel the garlic (it should just pop out of the skin). Once it has all been deboned check the Gazpacho for any other small bones that might have been left in the stock and remove them. Most people just leave the bones in, but it so much nicer not having to worry about them. Return all the meat and garlic to the pan and the stock and add the unleavened bread pieces, one bag at a time, depending on your stock level. The bread will soak up the stock so be careful, we don’t want it to soak up all the stock. Mix them in well and cook for a further 5 minutes and then let it stand for 5 minutes before serving. They go great with a glass of red wine and some crusty bread. I know it doesn't look very appetising but the flavour is out of this world!